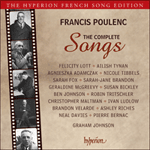 This is perhaps the least known and least substantial of Poulenc’s songs, as well as his last setting from Le bestiaire and his last Apollinaire setting of all—forty-two years after the first. It was written in homage to the memory of the painter Raoul Dufy (1877–1953) who had made the woodcuts that had illustrated Apollinaire’s first published book in 1918, the selfsame Le bestiaire. 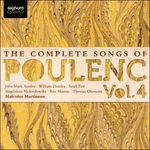 The song was published posthumously in 1965 in Marcelle Oury’s anthology in tribute to Dufy, Lettres à mon peintre. Qu’ils sont cruels ceux qui nous aiment! how cruel are those who love us! All our blood is spilled for them. It’s the beloved who are wretched.